Thank you for your trust in our company and for buying the new Beat Box 4+. We hope you enjoy it. Before you start using your Beat Box 4+ we strongly recommend to read this manual in order to get used to it. Do not expose your Beat Box 4+ to humidity or heat. Do not place your Beat Box 4+ on a table edge or bookshelf in order to prevent falls. The speaker may move over the surface when used at maximum volume due to the housing vibration. Turn off your Beat Box 4+ when you are not using it. Do not let it completely discharged for a long time. Portable speaker with Bluetooth 4.2, True Wireless Stereo technology and lights to enjoy your music in full colour. It also features a microSD and USB MP3 player, FM radio, audio-in and hands-free function. USB/ MicroSD decoder: reads MP3/ WAV files from external units of up to 64 GB capacity with FAT/ FAT32 file system. *This value is approximate. The battery life depends on the selected volume level and type of music. Press and hold On/ Off (1) for 2 seconds to switch on and off your device. You will hear a confirmation sound when switching on the device. The Function indicator (6) glows while the device is on. Press and hold On/ Off (1) for 2 seconds to switch off your device. You will hear a confirmation sound. At this point, the Function indicator (6) switches off. You can control playback functions from the speaker itself. Press repeatedly Volume +/ Next (4) or Volume -/ Back (3) to adjust volume. Press and hold the very same buttons to switch to the next/previous track. You will hear a warning sound when reaching the maximum and minimum volume levels. To start, pause or resume playback, press Play/ Pause/ Call control/ TWS (2). Note: Bear in mind that you can only control playback from the connected music player while using the Audio-in (11). When the battery level is below 10%, you will hear a sound that will remind you to charge it. Plug the mini USB end of the provided USB cable into the Charging port (12) and the other USB end to any device with a 5 V USB charging port (PC, USB wall charger, car charger, etc.) to charge the battery. The Charge indicator (13) lights up red and switches off once the charging process has been completed. The charging time is approximately 3 hours. Use a 5 V 2 A AC/DC power adapter. Do not leave your Beat Box 4+ completely discharged for a long time. Press Change function (5) until you find Bluetooth mode while your Beat Box 4+ is on. Once you have done this, press and hold the same button for 2 seconds, until the Function indicator (6) starts flashing. At this point, your speaker and smartphone or tablet can be paired. 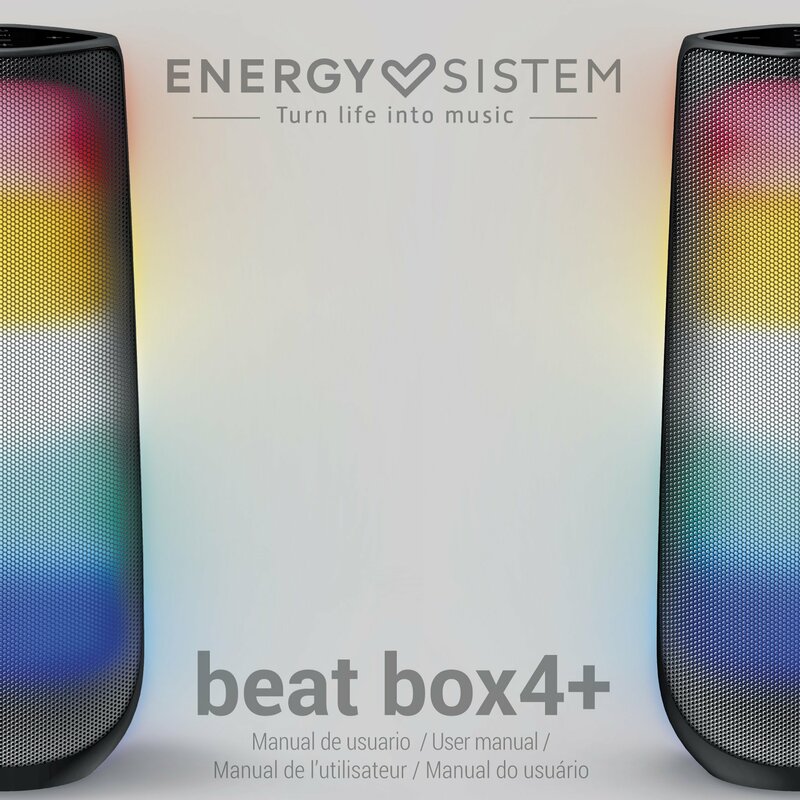 Once "Beat Box 4+" appears on your device screen, press "connect". The devices will be connected immediately and without codes. You will hear a sound that confirms both devices have been paired correctly. At this point, you will be able to start playback on your smartphone or tablet. The Bluetooth wireless connection's range is up to 10 meters. Your Beat Box 4+ will be automatically paired when you turn it on once again, provided that Bluetooth is enabled on your smartphone or tablet. In order to pair it with another Bluetooth device, press and hold Change function (5) until you hear a confirmation sound. By doing so, the current synchronization stops and the speaker starts a new search of Bluetooth® devices. Note: Your Beat Box 4+ turns off automatically after 5 minutes if Bluetooth® mode is enabled and not synchronized with any device. You can control your calls from the speaker itself. To do so, pair the Beat Box 4+to your smartphone. When receiving a call, the song you are listening to stops and the ringing tone sounds instead. Press Play/ Pause/ Call control/ TWS (2) to answer an incoming call and press it once again to hang up. The song will automatically resume afterwards. Press and hold Play/ Pause/ Call control/ TWS (2) when receiving an incoming call to reject it. This option makes it possible to wirelessly connect another Beat Box 4+ and hear music with twice as much power. This way, you will create a stereo sound system made up of two different channels: left and right. To do so, switch on one of the Beat Box 4+ and pair it to your smartphone via Bluetooth. Once you've done this, switch on the other Beat Box 4+ and enable Bluetooth mode. Press and hold Play/ Pause/ Call control/ TWS (2) for 2 seconds on the first speaker you turned on. A few seconds later you will hear a sound to confirm that both devices have been successfully synchronized. From that moment on, you can start Bluetooth playback any time to hear music through both speakers at the same time. The first connected speaker will be fed with the left channel (L) and the other one with the right channel (R). If you want to disable this function, press and hold Play/ Pause/ Call control/ TWS (2) on any of them. Both speakers will be disconnected. Switch to the next/ previous track and adjust volume from any speaker while TWS mode is enabled. If you turn up the volume of any of the speakers, you will be turning up the volume of both of them at the same time. Note: This is only possible if Bluetooth mode is enabled. 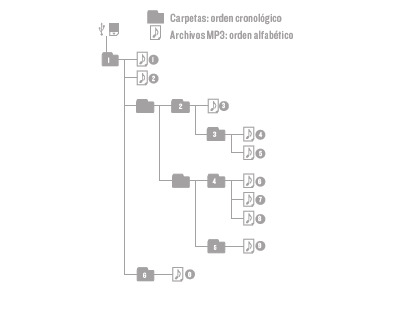 In all other playback modes (USB, microSD, FM radio or line-in) a TWS connection is not possible. Your Beat Box 4+ also features an Audio-in (11) for mini jack to connect your external devices using the provided audio cable. Note: It is not possible to control music playback from the speaker while using this mode. You will have to use the music player to control playback functions. Before using the FM radio function, it is necessary to carry out a search of all stations available. The radio stations will be saved to the speaker's internal memory. It is therefore not necessary to carry out a new search each time you switch it on. You will only have to do this if you place the device in a new location or if you change the frequency of the saved radio station. In order to carry out a search of all radio stations, press Change function (5) until the FM radio mode appears on screen. Press and hold Change function (5) for 2 seconds. 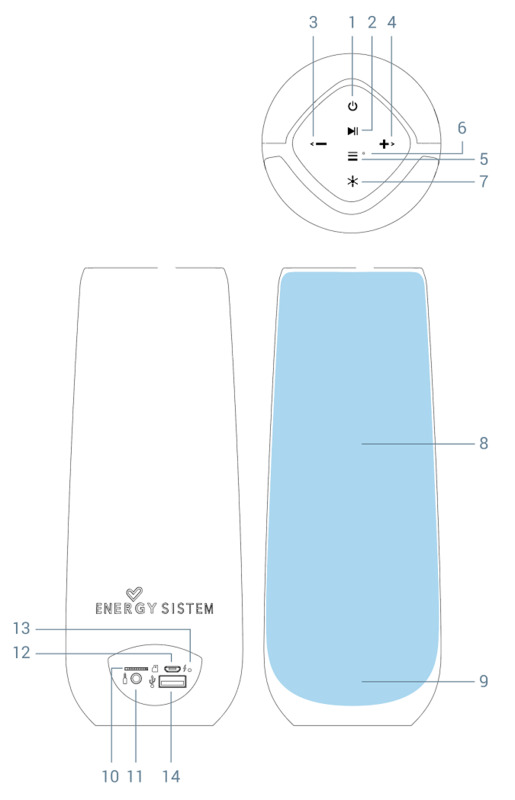 The Function indicator (6) flashes repeatedly while carrying out a search. Once the process is completed, the LED flashes slowly. The process may take a few minutes. Once the search has been completed, press and hold Volume +/ Next (4) or Volume -/ Back (3) to select the radio station that you want to hear from all saved radio stations. Your Beat Box 4+ will save the last selected radio station when you turn it off and on once again. Note: Plug the provided charging cable into the device to work as an external antenna and improve radio reception. To do this, plug the cable into the Charging port (12) and do not connect the other cable end. Start a new radio station search as described above. Note: The battery charging process may interfere with radio signals depending on the AC/DC power adapter used. The device plays .mp3 and .wav files from microSD cards of up to 64 GB. Once the microSD card has been inserted, the Function indicator (6) will start blinking. This means that the device is reading the memory card and the contents will play automatically after a few seconds. Press and hold Volume +/ Next (4) or Volume -/ Back (3) to fast-forward and rewind a song. Press and hold Play/ Pause/ Call/ TWS (2) for 3 seconds to enable shuffle mode. You will hear a sound to confirm the selected mode has been enabled. Shuffle mode will be disabled automatically when switching off the speaker. The root folders and files of your external cards or sticks will be read in chronological order and the songs included in your folders in alphabetical order. Note: You can get twice as much battery life if Beat Light mode is disabled. Press the hidden reset button located inside the Audio-in (11) to force the device to shut down.